Pacific Electric streetcar no. 628 passes a Los Angeles Railway streetcar heading north through downtown Los Angeles. 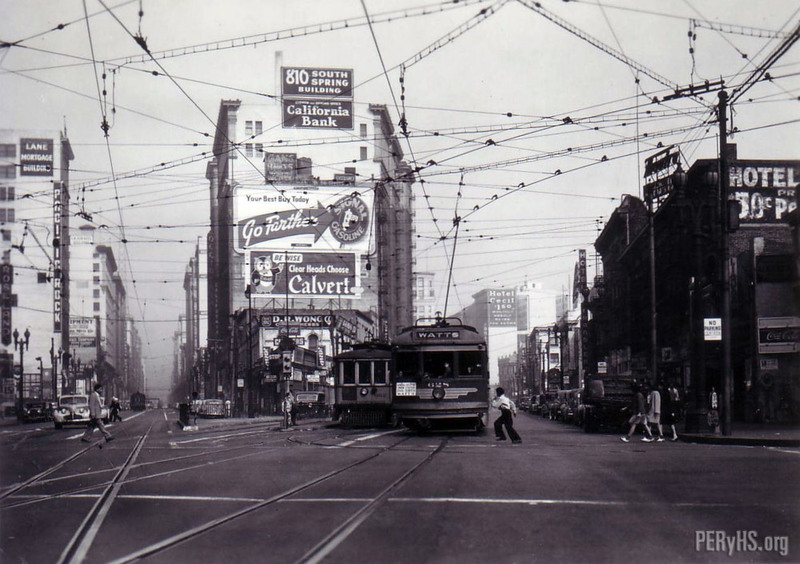 Off in the distance on South Main Street is the CECIL HOTEL, It looks the same today. This photo view looks down what is today the LA Historic Core. A fair number of the old buildings in the photo are still there today. PE 628 is actually going north and the destination sign on the north end of the car (the end we can’t see) probably says “Sierra Vista”. The car has almost completed the right turn from westbound Ninth Street onto Main Street – its trolley pole is still touching the curved part of the contact wire. – thank you, Paul – caption changed. – ed. Good catch Mr. Kakazu. . . . .